I’m going to admit it, sadly. I’m not that familiar with Joni Mitchell. I’ve heard many musicians refer to Mitchell as an inspiration, and I’ve known several friends who were fans. 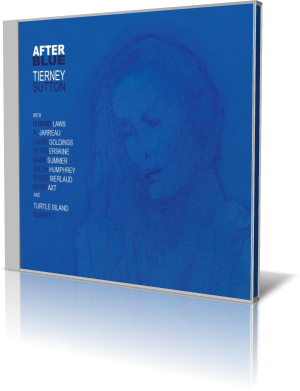 But honestly, apart from “Big Yellow Taxi” and “Both Sides Now,” I don’t know her songs as well as others, which makes it difficult to have a point of reference in relating Tierney Sutton’s After Blue (BFM Jazz, 2013) to Mitchell’s genius. However, this is Tierney Sutton’s album, and her voice alone is worth plenty. Having come up as a jazz singer with an affinity for the American Songbook, Sutton wasn’t familiar with Mitchell’s work until 2000, when she heard Both Sides Now. That set Sutton on a course to learn and hear more of Mitchell’s music. She eventually worked “Big Yellow Taxi” into her performances with her regular band of Christian Jacob, Trey Henry, Kevin Axt and Ray Brinker. By 2011, she was doing other songs with the Turtle Island Quartet. With Jacob immersed in a solo project and Brinker recently married and becoming a father, Sutton decided to embark on this tribute. She enlisted pianist Larry Goldings, who also plays Hammond B3 organ and several other musicians who appear in small combinations. Among them are drummer Peter Erskine, who actually recorded on Mitchell’s Mingus album; flutist Hubert Laws; Al Jarreau; Axt; and the Turtle Island Quartet. “Don’t Go to Strangers” is a slow, tranquil piece. Sutton is accompanied by Serge Merlaud on guitar and Axt on acoustic bass. It cannot be overstated that Sutton’s voice is like an alto flute with words. And when she goes into one of her wordless chants, she’s more like a reed instrument than a voice. One of the coolest pieces is “The Dry Cleaner from Des Moines.” With Goldings on organ, Laws and Erskine, Sutton breaks out the sass. It’s an upbeat, finger-snapping, head-bobbing groove. Sutton seamlessly moves from lyrics to scatting to a chant. Laws, Erskine and Jarreau team up with Sutton and Goldings for the swinging “Be Cool.” If having two superb singers is a good thing, imagine the thrill of two superb singers who are also superb scatters. The blend of these voices, complemented by Laws’ flute is a treat for the soul. The arrangements for After Blue make this more of a showcase for Sutton and less of a remake of Mitchell. Music lovers who, for whatever reason, are not familiar with the music of Joni Mitchell, can appreciate the voice and musicianship that Sutton and her assembled artists present.